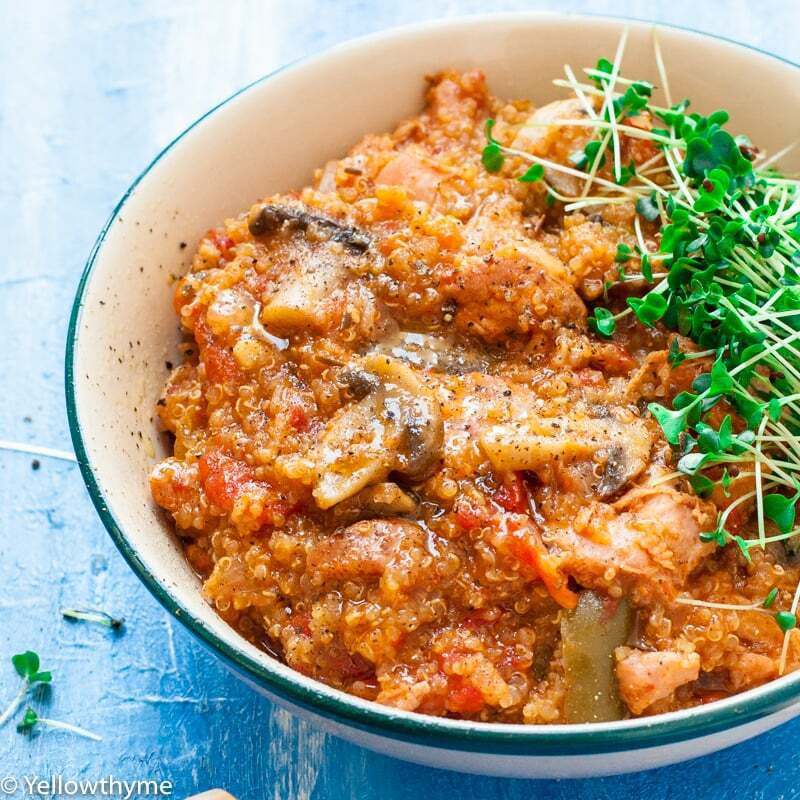 Mushroom Chicken Quinoa Bowl is a One pot All in one Wonder with Quinoa, Chicken and mushrooms, flavoured with rosemary and smoked paprika.This is a Super Healthy meal which can be made in normal pressure cooker or Instant pot in under 30 minutes! So the bug has caught me too!What can I say! I bought an Instant pot too.All the way from USA. This was the first dish I made in it..besides boiling water which is the first “check” you do on it.I promise to write about using Instant pot in India soon! Mushroom Chicken Quinoa Bowl is a wholesome – well rounded bowl of goodness with protein from the chicken, fibre from the veggies and carbs from the quinoa.It’s also gluten free and dairy free. I absolutely love the flavour the rosemary and paprika bring to the dish. This healthy Quinoa bowl can be made soupy almost khichadi like or dry like a pulav based on the amount of water you put in while pressure cooking it- in Instant pot or pressure cooker.I like mine khichadi like that thats why you see a soft texture in the picture. I made mine extra nutritious by sprinkling some micro greens on it too. If you are looking for more healthy quinoa recipes try my-Avocado & Quinoa Salad with Balsamic Dressing ,Roast Pumpkin Quinoa Salad and indulgent but dairy free- gluten free Moist Quinoa Chocolate Cake. This is such a dump whatever you have kind of a dish that the variations are endless!Use chicken or not..Use pork or not! Add more veggies, add peas, broccoli, carrots..Really you can do what you want with this dish!!! I mean, I understand..not everyone wants to experiment like me..it’s a new thing, its gluten free..has omegas and proteins and what not…but…if you don’t have it then let that not stop you from making this.. In that case, you can use Dalia or steel cut oats or plain old rice with this recipe too.I am sure it will be a winner with the rice! Do I need to soak the Quinoa? When you pressure cook the quinoa, you don’t need to soak it.For this Quinoa bowl- when making in pressure cooker or Instant pot, all you have to do is wash the quinoa and dump inside. Mix the chicken with smoked paprika, lime juice, 1 tsp salt and Rosemary and set aside. Using the sauté function, heat the Insta pot.Once hot add the oil. Add the garlic and chopped onion.Saute till golden. Add the marinated chicken and mushrooms.Mix it together and cook on high for 10 minutes. Switch off the Saute function.Add 1 Cup of water. Add the tomatoes, quinoa, green capsicum.Check salt.Also add more chilli for extra kick. Heat the pressure cooker on high.Add the oil. Add onion and garlic. Saute till golden. Add the Chicken thighs and brown it for 10 minutes.Add 1 Cup of water. Add rest of the ingredients- mushrooms,capsicum,quinoa.Check the salt.Add more chilli for extra kick. Here are some more Amazing Quinoa recipe from the blog! Loaded,Gluten Free Avocado & Quinoa Healthy Salad with Balsamic Vinegar and Shallots Dressing.